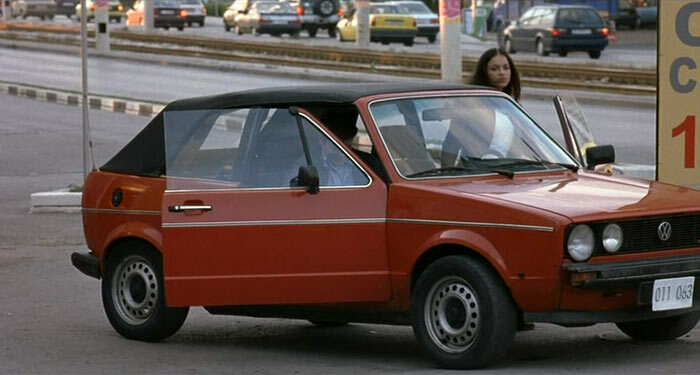 IMCDb.org: 1980 Volkswagen Golf Cabriolet I [Typ 17] in "Control, 2004"
What a plate is shall be? US-style, but no state-logo, mounted on a European holder. By the way, it's the European version (and with steel-wheels from a later Golf C or Standard). The front grille is also not original for the Cabriolet, perhaps the Kamei-grille for the four lamps. Also the small decoration-trims for the better equipped version (GL and so) are missing. The Cabrio was not available in the standard-versions like C or CL. Ah, I just read, that it was made in Bulgaria, but shall be located in the US. Very "un-american", the cars in the background (their European 52 cm-plate-size anyways), the VW Passat Variant (35i), Renault 11, Opel Kadett Cabriolet, Audi 80 1986+, Renault Laguna, Opel Kadett E, Opel Vectra and Lada. There are two more Ladas.